Other Products: Gala Glitz-Teal, Water Mister, Hole pricking tool, Dutch Doobadoo modeling paste, Spatula, Crafters Workshop 12 x 12 template TCW261 ART IS,. Inks: Jet Black Archival Ink, Distress Inks: Forest moss, Fired brick, Victorian velvet, Wild honey, Black Soot, Mustard seed, Crushed Olive, Aged Mahogany. Lindy's Stamp Gang Sprays: Grab a Guy Gold, Hydrangea Blue, Ponderosa Pines Olive, Hot glue gun, Versa-mark, Fussy Cutting Scissors, Misti stamping tool, Card-stock: Brown, Taupe. Inks: Zig permanent blackball pen 5mm, Hot glue gun, Double sided tape, Ruler, Green Bling Stones, Water Mister, Inking tool, Water coloring brush, Ruler. 5x photos. Instructions: For a peek at the inside pages see here. For more photos, visit my blog. Take the 8 1/4" x 9" 3 ring journal folder, the modeling paste, spatula and the crafters work shop template to first apply the letter writing to the front cover and spine of the journal folder. Put aside to dry. Returning back to the journal front cover when the cover modeling paste is dry, spray with the Lindy's stamp gang sprays till you get the color you want. Misting with water if needed. Do this also to the back cover of the journal. Dry the sprays with the heat it tool or you can leave it to air dry. Take the eyelet die and die cut the frame from a piece of white cardstock. Trim the inside part away from the lace out side edge. Put the inside part aside for later. Bring the Wild honey and Fired brick ink onto the lace frame edge. Taking the scalloped oval die from the small oval die set cut this x 6. Take the Words of Comfort stamp set and find the sentiment with 'Today I Choose' on it. Stamp this on one of the ovals with the aid of the misti-stamping tool. Adhere all the layers together with wet glue so you slide it to match the scalloped edge. Taking the banner die from the 'Banners Of Love' die set and the stamp set 'Todays Quotes' and find the stamp with 'Todays Accomplishments'. Use the two in combination to make the banner. Cut the banner x 3 extra from the card-stock, adhere all together to make a chipboard banner. This is to be sprayed with the gold Lindy's stamp gang spray later when the spraying is done to the journal cover. 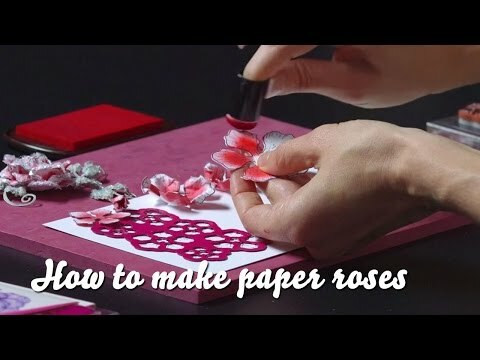 Taking the white card stock and design paper scraps from the Young At Heart paper collection, use the classic rose stamp and die set to make the rose petals and leaf swirls. Use the distress inks to bring color to the leaves, rose petal tips and centers. Spray the petals and leaves with the water mister place in the rose mold then put the mold through the die cutting machine twice to get a good press. (Do not make the paper or card-stock too wet as the paper will break in the mold when you put it through the die cutting machine. If you do make it too wet, leave to dry until they are just moist just as you would when balling to bring shape to the petals with the tools.) For the blue / green colored flowers, these are sprayed with the Lindy's stamp gang sprays. Spray also the cut away inner part of the eyelet frame that was put aside. Leave to dry a little, as the petals will still be too wet. When ready put these through the machine in the rose mold. Take the petals out of the molds with the aid of the piercer tool found in the flower shaping tool kit. 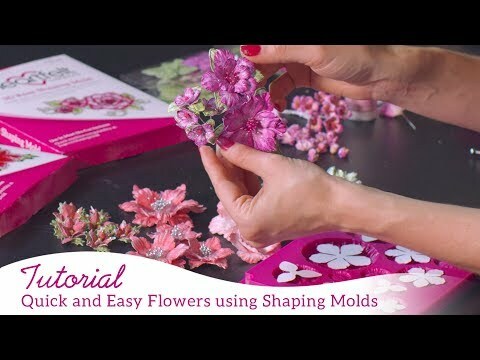 Leave the shaped petals to dry completely. When dry, shape the centers so the petals cup up. Prick a hole in the petal center so you can thread the stamens through the opening. The stamen colors used are the pink and the green found in the bright pearl assortment bundle. Take three stamens, fold in half then thread the stems through the whole. Secure at the back with the hot glue gun. The glue is cooled off, trim the excess stems away. When the cover is dry, adhere the outer part of the eyelet frame to the center of the cover. Cut the sprayed eyelet center frame in half and adhere each piece below and to the sides of the outer frame. The scalloped frame with the sentiment is spritzed with the Lindy's stamp gang sprays. The banners colored with the blue spray and the out side highlighted with the gold spray. Mist so the sprays will run a little. Adhere this to the inside of the eyelet frame when dry. Arrange the leaf swirls and flowers to and around the frame. Adhere with the hot glue gun. Apply the wet glue for the Prills and Gala glitz as shown in the photo. Using the tray, apply the Prills and Gala glitz with a spoon and sprinkle gently so the prills will not bounce everywhere. The small banner that has been sprayed with gold, adhere to the bottom right of the journal cover. Find the two pages with the coffee cup / chocolate cup on it from the inspiration journal pages. For all three pages, arrange the photos wanted for the pages where wanted, trim to size if needed. Taking the brown and taupe card-stock mat the photos as seen in the photos. Adhere the photos with double sided tape to the matting. 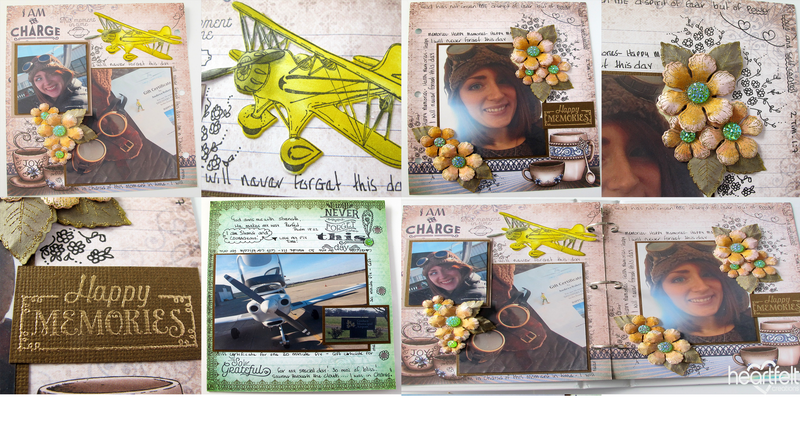 For the 1st and 2nd pages, stamp, die cut and color the airplane using the white card stock. Adhere this to the page corner as seen in the photo of the pages. Stamp the flowers and leaves with the gold embossing powder, die cut and color with the inks from the product list. Bring a little shape to the flowers and leaves, not too much if they are too high they will get crushed and will take too much room in the journal. Adhere the made flowers and leaves to the corners of the photos on each page shown in the photos. Apply and adhere the bling stones with the hot glue gun to the flower centers. Find the 'Happy Memories' sentiment stamp from the listed stamp set, brown card-stock then stamp this with the gold embossing powder. Trim the sentiment card-stock to size, adhere to the page. Taking the permanent marker pen, write two rows of journaling around the photo matting edges, doddle the flowers, leaves and dots in the corners of the flowers and leaves. Taking the stamp sentiment of 'This moment in time' and stamp it next to the 'I am in charge' print in the paper. Find the stamp with the scripture 1 Tim 1:7, copy the scripture verse and hand write the verse to the outer edge of the second page. For the 3rd page, the journaling is written around the photo card-stock matting. Use the sentiment stamps 'So grateful' and 'I will never forget this day' to stamp with the black ink at the top right and bottom left of the page. The stamp with the verse from Psalm 18:32 is hand written as journaling. Continue to fill the page with doodling and journaling about the event and photos. The page that would follow this page could be used only for journaling about the days events or it could be used to start a record of a new adventure.